The church is combination of cross forms, which was a very important image in the Eastern church. The importance of the cross in the development of Eastern Christian architecture and especially that of Armenia is illustrated by a number of facts. Eastern Christianity inherited, both from the Old Testament and from the earlier pagan cultures, the tradition of the cosmic symbolism of the cross and the number four. The worship of the dead was practiced in its form, using central-plan edifices (cruciform or square), whose axes of symmetry form a cross (oriented, a feature which originated in pagan cults and was maintained by the new religion), defining, at ground level, or even under ground, the four cardinal points of the compass, above which vertical structures (steles, ciboria shapes, additional levels with halls for worship and conical or pyramidal roofing) were placed, all arranged in a symbolic connection with the center of the earth (the Underworld symbolized by the intersection of the axes of symmetry at the point it met with the heavens). In the vision of St. Gregory, four crosses represent four places of martyrdom, those of the virgins Guyaneh, Hripsimeh and their companions, connected by a large cupola or tent. The cross, in Armenia, became a true object of worship, taking on dual divine significance, a symbolic meaning, as the �sign� of Christ, symbol of his victory over death, memory of the site of his sacrifice; and a physical meaning, in the sense of a relic, the adoration of which was connected to faith in miraculous effects. The rejection of the decisions of the Council of Chalcedon (451 CE, where the doctrine of Diophysitism --the two-nature doctrine-- was approved by the Greek Orthodox church, condemning that of Monophysism --the single nature of Christ doctrine) prompted the Armenians to place greater emphasis on the divine, rather than the human, nature of Christ. This led to an avoidance of representations of the Passion, and to a preference for the sublimation inherent in the symbol of the cross, as opposed to explicit iconography. 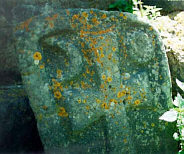 The Khachkar was unique to the Armenian church, inherited from the Vishap (Dragon Stone) tradition beginning in the 5th millennium BCE, and became related to the worship of Astghik, the goddess of water. These monuments continued to be used during the pre-Christian period, some have survived to the early Christian period (4th-5th cc.) and were models for column-like monuments bearing the sign of the cross. Khachkars evolved from the 4th c., when more primitive crosses were erected on the sites of pagan temples before churches were built. The earliest attempts to replace them with stone crosses date to the 4th-7th cc. These are called �wing crosses�, some found during the excavation of Dvin. They served the basis for a unique Armenian art form--Khachkars. Beginning in the 9th century, the cities of Armenia (Ani, Lori, Kars, Van) experienced a dynamic growth and along with the construction of churches throughout the country, thousands of Khachkars appeared. Forming a separate group are the so-called Amenap'rkich or all-savior Khachkars, distinguished from others by a carving at the top of the crucifixion scene. People have ascribed healing qualities to these and converted them into shrines. In Khachkar inscriptions beginning with the 12th century appear the names of master carvers. The most famous master of that period was Mkhitar who, with his apprentice Avetis, carved the Khachkar of Dudevordi. Many Khachkar masters were also famous architects who designed cathedrals, among them perhaps the most famous is Armenia�s "Michelangelo," the miniaturist, architect, and sculptor Momik who worked in Vayots Dzor during 1282-1321 CE. His Khachkars can still be found at the Amaghiu Noravank, near Areni. The Khachkars in Goshavank (1291 CE), by the master Poghos, as well as that in the yard of Geghard monastery (1213 CE), by the masters Dimot and Mkhitar, are recognized as masterpieces, as is the work of Vahram, the creator of the Khachkars of Haghbat and the Amenap'rkich of Dsegh, who gave new form and content to their design. With the Seljuk invasions, the Khachkar reached the end of its golden era. In the 16th and 17th centuries,; Khachkars experienced a short revival, although it did not attain the artistic standards of the earlier period. Samples of the latest phase in the evolution of Khachkar art are those in the graveyards of Old Julfa, Kamo, and Noradus. If you compare the churches in Armenia to the later ones in Europe, it seems there is little in common between them. Armenian churches are much smaller, and are not designed around the cult of icons as developed in Orthodox churches. Part of this is due to the loss of countless frescoes on church walls over time ( few fragments remain in the National Gallery in Yerevan). Another is that Armenian churches had limited sources of light, as the drum that forms the base for the peaked dome was often closed, and the few windows that were built were narrow. What can be seen, and which form the most lasting legacy of the Christian era in Armenia are the superb high relief carvings which adorn the exterior of the churches. Depictions of the life of Christ and the Virgin Mary are complemented with apostles and saints in highly detailed forms. These are living books for the local population, they have a specific meaning in how they are placed, and what they describe, and the simplest peasant could "read" them and understand. We are talking about a country still based on the feudal system, with not a lot of literacy down below. Even though the alphabet was reintroduced to Armenia in 406 CE, which allowed Armenians to preserve their language and increased the power of the church over its followers, it didn�t mean reading primers suddenly appeared in village schools. The written language was reserved for the upper classes. For the large peasant class that could not read or write, the architects and builders of new churches had to create iconography on the face of the churches which could instruct the faithful while impressing on them with the supreme power of God. Exactly like the beautiful stained glass windows in Gothic Europe, which were storybooks of the scriptures for the illiterate class, Armenian churches and stone carvings were deliberately created so that even the most illiterate would understand their "story" and recount the holy scriptures. Sacred architecture in Armenia was indeed books in stone. The average Armenian (who was not that far removed from his pagan roots) took note of every detail in church design. Were the four cardinal points used in the layout of the church? ; Was the altar oriented towards the East? ; How many combinations of the sacred numbers 3, 4, 6, 7, 9 and 12 were used? ; They may have been illiterate, but they were quite aware of the need to create a harmony between the cosmos and the heavens. To a startling degree, Armenian sacred monuments hold fast to the rules of sacred geometry, which formed the basis of the ancient Armenian and Greek religion and science. You can see the roots by looking at the pagan temples: bulls, lions and eagles always represent power over the vanquished. The lamb is interestingly portrayed, in the West we consider it the lamb of God Christ, the symbol of the meek and peaceful. In Armenian iconography, it is often (not always, but often) portrayed as the victim of attack from a greater power. Partly this is thought to be because the Armenians themselves were considered lambs at slaughter, by successive waves of invasions by Byzantines, Persians, Seljuks and later the Mongols and Ottomans. Certainly the day to day life of Armenians was often grim, and the softer notions of Christ�s teaching were often steeled against attack by Zoroastrian and then Moslem aggression. 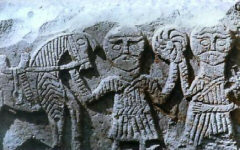 There are very few depictions of mercy on the stone carvings, they represent power, and fortitude. The rewards were to come in the after life, not now. Another thought is that since the lion and the eagle are very close to Armenian pagan traditions, representing the power of a ruling dynasty, and by extension,; the power of the Armenian state itself, they are clutching the lamb not in retribution, but to show they have the divine right of Christ in their hands, or the jaws of their teeth. Animal imagery became; advanced after the Arab invasions beginning in 640 CE. Abassid and Seljuk brought a distinctly oriental culture into the Armenian country, which gave rise to ever more increasing use of animal and nature in covering the exteriors of Armenian churches, especially from the 11th to he 13th cc. This may have been a result of the Moslem religion forbidding the depiction of the human form in art, forcing new Armenian churches to use the accepted animal iconography as a symbolic representation of the scriptures. At the same time, depictions of the saints and apostles were set next to or surrounded by symbolic animals. The animals are distinct in celestial and demonic symbols, and have their roots in Mesopotamian and Urartian origin of guard animals near openings (especially windows). Depictions are often of winged creatures (symbolizing redemption), fighting animals symbolizing the fight of good over evil, numerous quadrupeds, which are not always identifiable. In some churches protruding heads of wild boars, stags, rams and especially bulls form series along the top of the drum, the capitals of columns, and along the walls themselves. The symbol of the bull was favored by the Urartians and Mesopotamians as a symbol of power, as are the lion and eagle, often shown pouncing on their prey. Grape vines, pomegranates or trees are symbols of life. The tree of life is a very old symbol in both Christian and pagan religions, and can be found throughout the Mesopotamia and Asia Minor, as well as in Judaic religion.